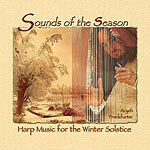 CD review: "Sounds of the Season: Harp Music for the Winter Solstice"
An all-instrumental, all-acoustic outing, this album mostly tackles trad holiday fare ("We Three Kings," "Bring a Torch," "Greensleeves"). Many of the tracks have a non-traditional opening, perhaps playing off a secondary theme rather than the refrain. Once the players (in addition to Frankfurter's harp, there are violin, pennywhistle, dulcimer, recorder and more) get into the meat of the main theme, though, the arrangements are pretty much straight-ahead. Fans of the various Windham Hills holiday releases are likely to enjoy this CD as well.